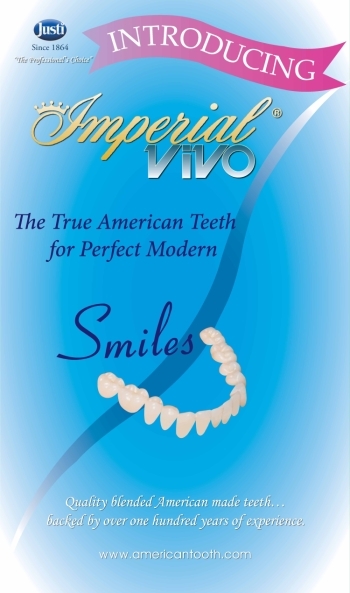 Justi Imperial ViVO® offers an incisal and interproximal blend that give this beautiful line of teeth the unique ability to absorb and reflect surrounding color. This means more latitude for blending with natural teeth – resulting in less resets due to shade, especially in partial denture cases. 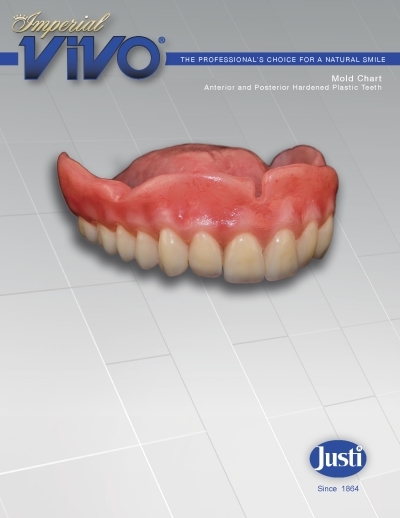 Justi Imperial ViVO® offers traditional quality American molds using the newest Vita® shade system. The effect of this combination is outstanding aesthetics and excellent functionality for the modern technician. The ability of the teeth to blend into the adjacent dentition makes producing great looking dentures and partials much more predictable. The cross-linking system employed in manufacturing the Imperial ViVO® tooth line further enhances resistance to wear. 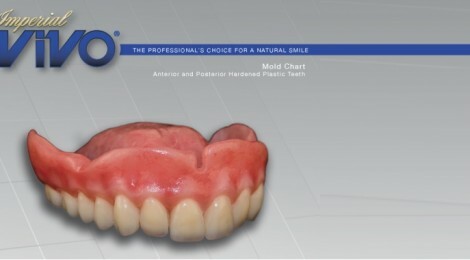 Guarantee: Backed by 150 years in denture tooth manufacturing. Written guarantee available upon request. The Imperial VIVO® line is available in 16 of the Classical Vita® type shades and 3 bleached shades: OM1, OM2, OM3, A1, A2, A3, A3.5, A4, B1, B2, B3, B4, C1, C2, C3, C4, D2, D3, D4. Mold Selections: The Anterior mold selection consists of 24 upper and 9 lower molds. The Posterior mold selection consits of 12 upper and 12 lower molds. Imperial ViVO® Special upper anterior AXL central incisors and upper posterior PXL36 bicuspids are specialty items that will save you the expense and trouble of making custom teeth when you need to fill a large anterior space in a complete upper or partial denture. The upper posteriors may also be used as a molar. These specialty teeth are available in all 19 ViVO® shades. All teeth are made in the USA backed by over one hundred years of experience.